Here’s a case of a character that took me by surprise. With the previous entries of this special week-long look at East of West – Death and the other Three Horsemen – they made an immediate impact as striking, powerful characters. 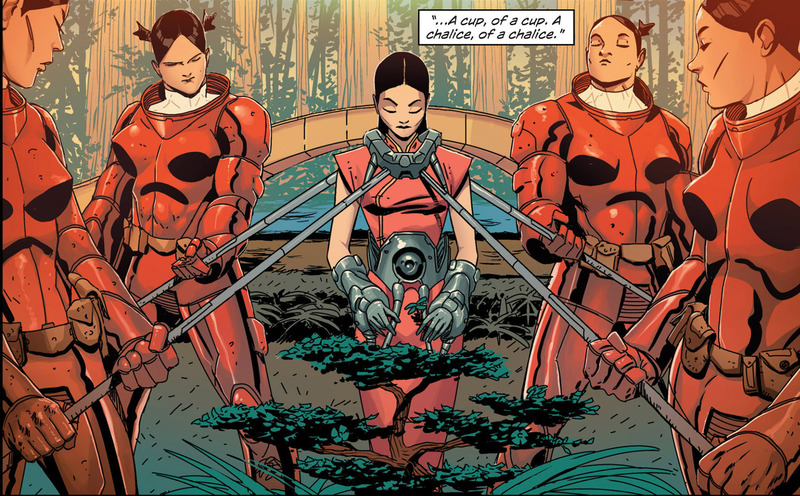 With the way Xiaolian was first introduced in issue #2 of the series – in shackles, as seen above, with a surprise reveal that Death had a wife and though he thought her dead she was in fact alive – there might have been concern that she would not be a character of agency. The “damsel in distress” is of course a common trope in fiction, and so when a female character is first introduced like this, I feared that she would just be a princess in a castle, a largely abstract object whose rescue would become Death’s long-term goal fuelling him throughout the series. Far from being a long-term goal, her freedom is secured within another 2 issues. And rather than waiting passively to be saved, she plays an active role in securing that freedom: it is her, not Death, who slays her father and sister that rule the House of Mao and have kept her prisoner for 10 years. Xiaolian is revealed to be a strong, nuanced character with a compelling backstory in her own right. She is revealed to be a formidable warrior, someone convincingly capable of taming the heart of Death. And while the narrative of Death’s betrayal is almost entirely a mystery at this stage, we’ve had a more substantial look at the agonising cost inflicted on Xiaolian in this time, witnessing her being betrayed by her sister, fighting but inevitably falling to the combined might of the Three Horsemen, losing her hands, and having to watch on helplessly as her infant son is seemingly killed. But this is no “woman in refrigerator” scenario where a female character suffers solely to motivate a male character. It motivates Xiaolian, and we can see how it has changed her, and we witness her begin to enact a revenge of her own. Xiaolian benefits from a cracking design by Nick Dragotta, too. 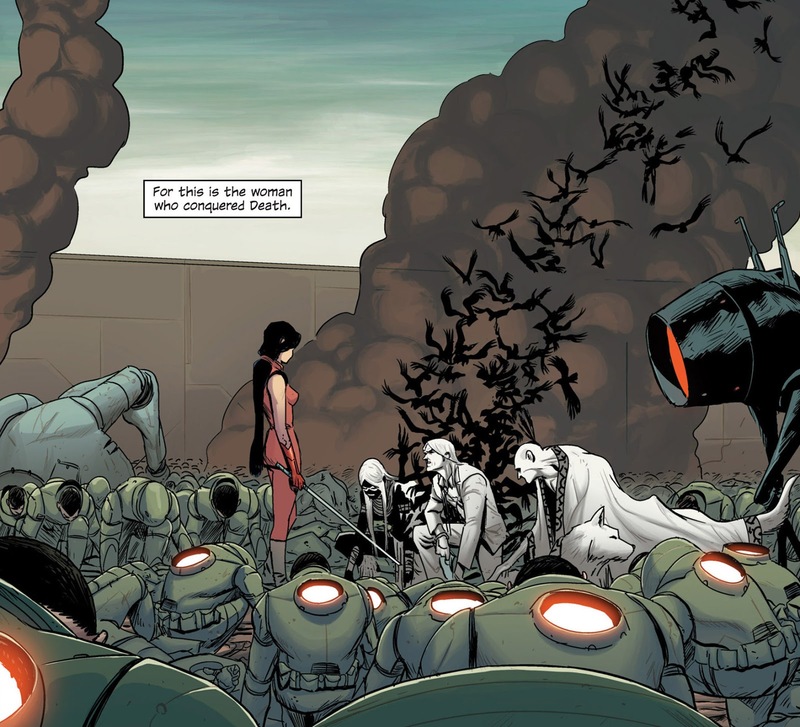 In the divided alternate America of East of West, thus far I’d argue it’s the Chinese-populated People’s Republic that Dragotta has brought to life most evocatively, with reimagined American landmarks and the mecha-styled outfits of the armies. Xiaolian benefits from this aesthetic, while also emerging as distinctive in her own right, thanks largely to her cybernetic prosthetic hands. In our most recent sighting of Xiaolian, her circumstances have changed substantially, with her repositioned as Premiere of the House of Mao and of the PRA, leader of a vast army, and primed to go to war with the other 6 nations of America. She’s arguably the most powerful mortal player in the grand East of West tapestry, and seen as a formidable threat by many other characters in the ensemble. Any worries about her being a background player were utterly unfounded, as she is now one of the prime movers-and-shakers of the whole narrative. But what really earns her place on this list is that she is, in my opinion, the most fully-realised character in East of West, arguably the heart of the whole story.